This dip is the dip of all dips! A perfect ending to a romantic meal with your honey! Enjoy. Bring the heavy cream, butter, sugar, corn syrup and salt to a simmer in a small saucepan over medium heat, whisking occasionally, until the butter melts and the sugar has dissolved, about three minutes. Whisk in the chocolate and cocoa powder until smooth. Remove from the heat and whisk in the liqueur and vanilla. Transfer the sauce to a small bowl. 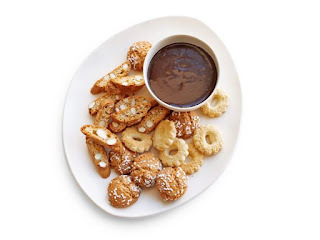 Serve warm or at room temperature with cookies for dipping.